In what is being billed as one of the finest comeback stories in sporting history, Tiger Woods has won his fifth Masters following a one stroke victory early this morning in Augusta. Woods’ closing round of 70 for a 13-under-par ensured he won by one from Dustin Johnson, Xander Schauffele and Brooks Koepka. It was Woods’ first ever come-from-behind victory at a major championship with each of his previous major titles coming from at least a share of the 54-hole lead. Overnight leader Francesco Molinari, who showed such poise for three and a half days, found trouble over Augusta’s famous closing stretch. Reeling from an earlier double-bogey at the par-3 12th, the reigning Open Champion further came undone at the 15th, where he found the middle of a pond when only 60 metres from the hole. The 36-year-old took another double-bogey and had to settle for a share of fifth – still a solid performance from the Italian. Yet it was a master class by Woods as he hunted down the leaders during the heat of battle, which at one stage had six players contending for the lead. Koepka, Schauffele and Patrick Cantlay all made charges, and when Cantlay nailed an eagle at the 15th he moved to the top of the leaderboard at 12-under. Schauffele then joined Cantlay with a birdie at the 14th. Dustin Johnson was also making his move with birdies at the 16th and 17th edging him into a share of the lead. Cantlay’s pair of bogeys at the 16th and 17th put an end to his chances and Johnson posted what he could but knew it would not be enough as the final group had holes on their side, including reachable par 5′s to take advantage of. In true Tiger fashion, dominate driving and peerless iron play from Woods allowed the 4-time champion to pick up birdies at the 13th, 15th, and 16th on the back nine. Not even a bogey at the last would stop Woods claiming such an emotional victory. Two years ago, Woods was not able to even swing a club. As back injuries took hold, Woods had fallen out of the world’s top 500 golfers by May 2016. Eighteen months later, he was 1,193rd. Surgery in 2017 had Woods back following an extensive recovery period with many predicting he would win another Major and his critics saying he was past his prime. Woods let his clubs do the taking. Woods’ victory, aged 43, takes his tally of major titles which includes the Masters, US PGA Championship, US Open and Open Championship to 15. This latest success, though, is being widely heralded as his most remarkable. He became the youngest-ever winner of the Masters in 1997, aged 21, by an astonishing 12-stroke margin and was ranked as the world’s No 1 golfer two months later. Twenty-two years later he’s added another green jacket to his collection which has seen him win the Masters in each of the last three decades. 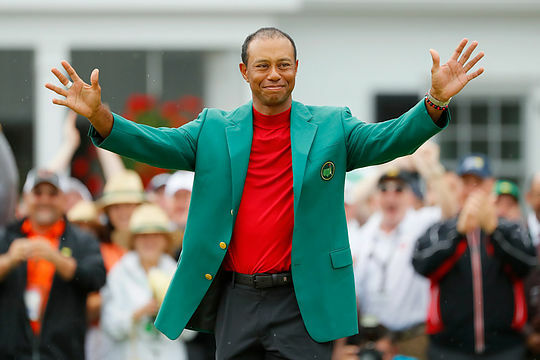 On top of everything else, Woods also becomes the first Masters champion to win more than US$2 million in prizemoney taking his total career earnings to $US118,309,570. While the Aussies were looking strong earlier in the week, it was another year of missed opportunities. Jason Day almost pulled off the impossible but couldn’t erase the damage suffered yesterday when he closed with a 1-over 73. He reeled off six birdies and just one bogey today on his way to a superb 5-under 67 for a share of 5th place. Adam Scott enjoyed a solid start with rounds of 69 and 68 but couldn’t get the putts in when it counted and slipped away to finish in 18th place alongside Phil Mickelson and Patton Kizzire. Marc Leishman (T49) and Cameron Smith (T51) were the last of the Aussies in the field.